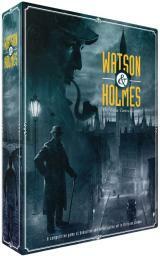 Race to find the truth in the mysterious world of Watson & Holmes, a game of deduction and intrigue for two to seven players. Each aspiring detective will work alongside Sherlock Holmes in order to solve a series of mysterious cases. By visiting locations, speaking with witnesses, and deciphering clues, you will come to your own conclusions about the investigation, independent of your fellow detectives. Once you believe you have all the facts, you must present your findings to the brilliant Holmes and the good Dr. Watson. Answering every question correctly will lead you to victory, though one misstep and you will be forced to retire from the case, leaving the remaining investigators to accurately interpret the clues before it’s too late. Thirteen mysteries. Two to seven players. A competitive, deductive experience like no other.